First up, we had the boys on a case. The entire set-up was fantastic and the brotherly banter was a great bonus. They find a pawn shop that has an underground business in ancient relics. Valuable asset, except the owner got his goods in not-so-nice ways. The boys know for sure that the skull of Sarah Good, a woman who was executed during the Salem Witch trials, used to belong to a hunter named Bart Kemp. Now Bart’s dead, the skull is missing, and the pawn shop owner has it. Pretty easy to figure out what went down. 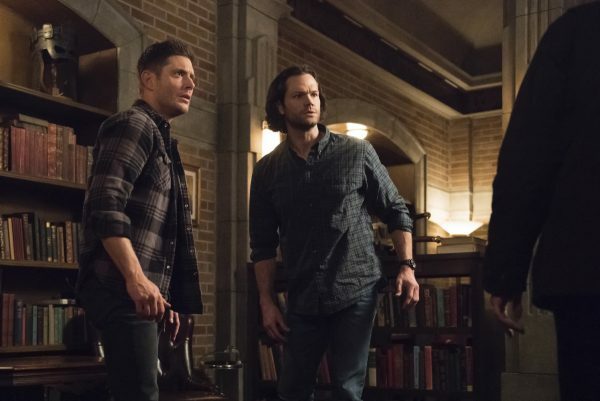 With a quick fight, the pawn shop owner is no more and the Winchesters are now in possession of a lot of important supernatural items. Seems like something they should take back to the bunker and catalog. On top of that, we get some insight into the boys’ reputation in town. They are a mysterious lot, as you can well imagine, and the local teens are telling ghost stories about them when they pull up in front of the local movie theatre. 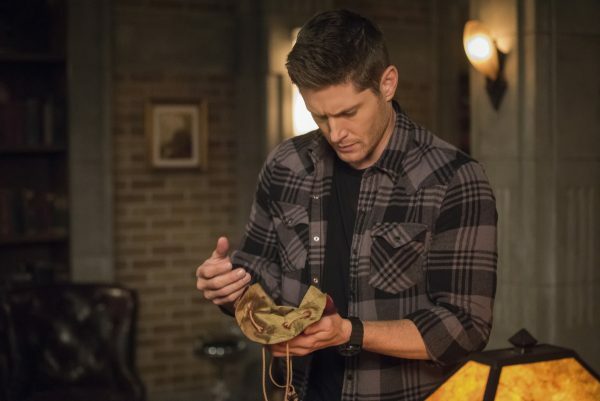 While they go for a quick drink at the local bar, where we find out they’re known as the Campbell brothers, Sam finds an entry about one of the items they brought back – Baozhu, a Chinese pearl that grants wishes. Sam thinks it might be the answer to the Michael problem, and it’s worth a try. 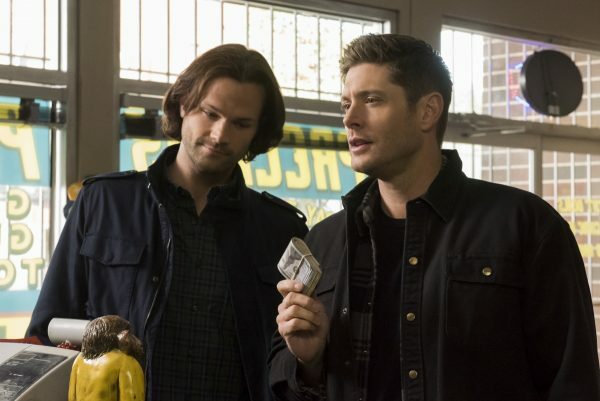 Too bad the Impala and all the ancient relics inside are stolen by one of the kids while they’re distracted. What follows is a race to get information and retrieve the car before something bad can happen. 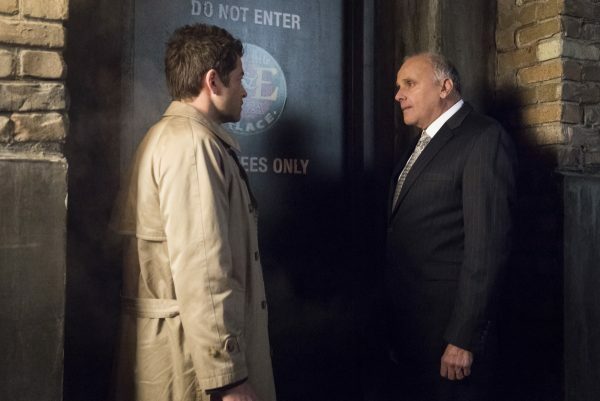 I love that we begin to understand how well-integrated Dean has made himself in town. Not only was he welcomed at the bar, he also shows that he’s built up a friendly relationship with the local postal worker. Dean is a charmer and he can use that to his advantage time and time again. 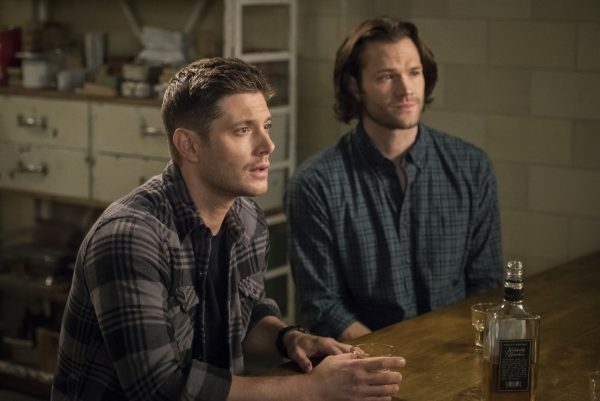 Good thing, too, because it helped the Winchesters track down the teens, who are hanging out at an abandoned house during what is deemed a school skip day. Supernatural items in the wrong hands can cause all kids of trouble, as we soon found out. The problematic item in question was a possessed John Wayne Gacy cigar box, which comes to life and allows the ghost of Gacy to roam free so he can begin attacking the kids. The whole situation with the boys saving the day and exposing their true jobs to the teens was storyline gold. Dean ragging on Sam for his love of serial killers at odds with his fear of clowns, the kids learning what really goes bump in the night, and the Winchesters’ final arrival back at the bunker was filled with great banter and lovely set-up for what might come. The pearl grants wishes, Dean’s wish is to get rid of Michael from his head, seems like a no-brainer. Except, Dean’s deepest desire is for his father. 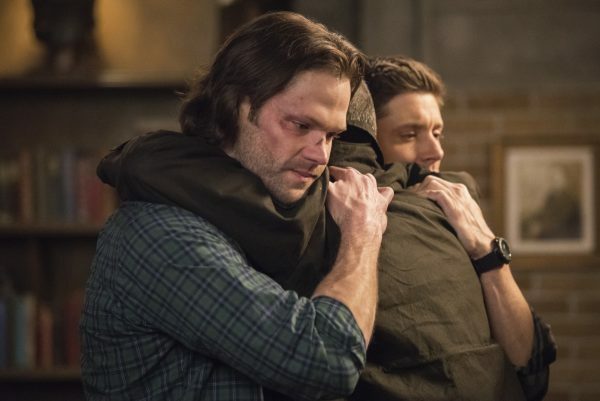 Just like he brought his mother back to life, Dean’s longing for his father managed to make John manifest, too. 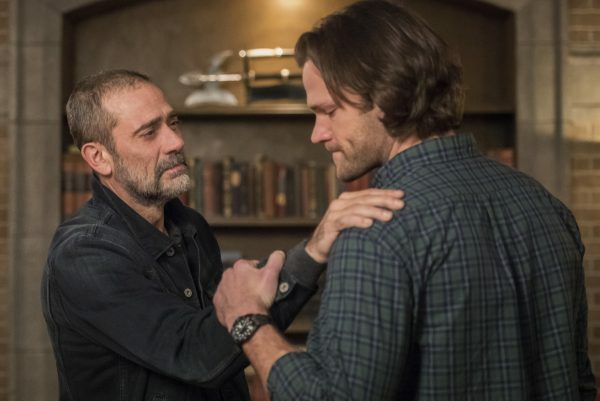 This was the moment we were all waiting for and it was a reunion filled with shock, happiness, emotional crying, and just a deep love for all things Winchester. John is pulled forward from 2003 and gets to hear about what his boys have been up to in the time between then and now. His sons have grown strong and saved the world many times, which is something to be proud of. Plus, not only does he get to see his boys again, but he gets to reunite with now-alive Mary. That was an absolute emotional roller-coaster of a reunion, from Mary’s shocked expression and almost falling to her knees at the sight of her long-lost husband, to the immediate embrace and kiss of two lovers who have been separated for much too long. The boys finally have their entire family back together again. 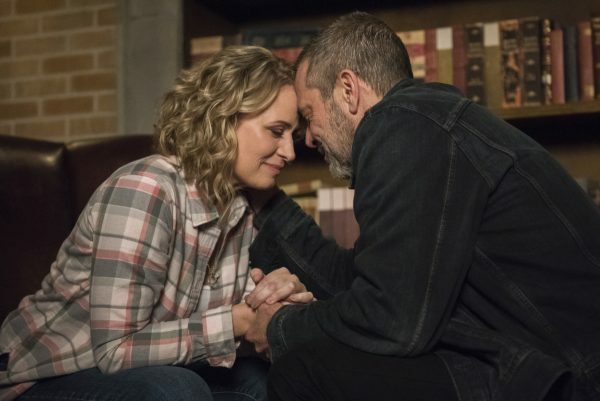 But, like all things Winchester, good times cannot continue for long. When they head out to the grocery store for supplies, so they can have a nice family dinner, that’s when the ramifications of their actions become clear. 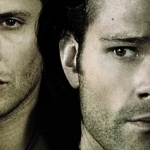 The townspeople don’t recognize them, Dean’s got a wanted poster up in town, and Sam’s got a video online of his other self as a popular lawyer turned inspirational speaker. They’ve created a temporal paradox and, if they don’t fix it, they will become those other versions of themselves, which also means all the actions they took will be undone – including Mary’s resurrection. 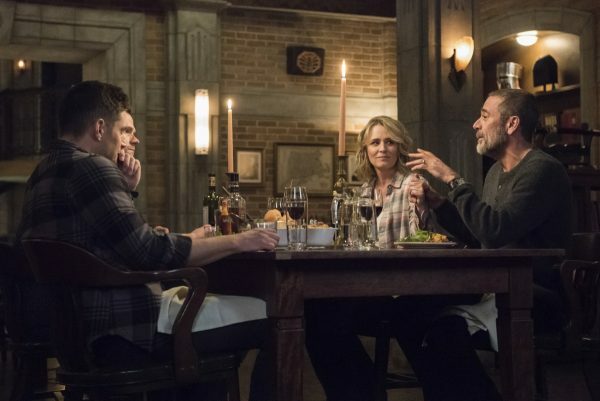 Plus, Zachariah is back in the picture and Cas is the old version of himself, which does not bode well for the Winchesters. Lots of complications for one simple wish. 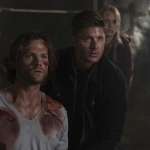 Sam manages to stab Zachariah and then banish Cas with an angel sigil, but not before both Dean and Sam suffered some major physical damage. And upon returning to the bunker, they’ve got to relate all the temporal paradox information to their parents and figure out what to do. But, really, there’s only one choice. Off course John chooses to go so that Mary can stay. But before the tearful goodbyes, they are going to have one last family dinner together. Cherish the memories of happiness before they have to lose John again. I did like that, before John had to depart yet again, he got to have real heart-to-hearts with both his boys. He apologizes to Sam for the way things went down between them and forgiveness is finally voiced. Sam’s regretted not being able to say goodbye, since he saw his father dead on the floor of that hospital room. Now, they both have a chance to clear the air and focus on the good. They love one another and that will never change. And John admits to Dean that he never meant for his fight to extend to them. It was supposed to end with Yellow Eyes and Dean was supposed to be able to go on and have a normal life with a family of his own. Dean’s okay with the way things turned out, though. He has a family and he has a purpose. Maybe it wasn’t the plan John had for him, but it’s a good life. And we get to hear that John loves his boys and he’s proud of them both. A perfect ending to an emotional celebration.